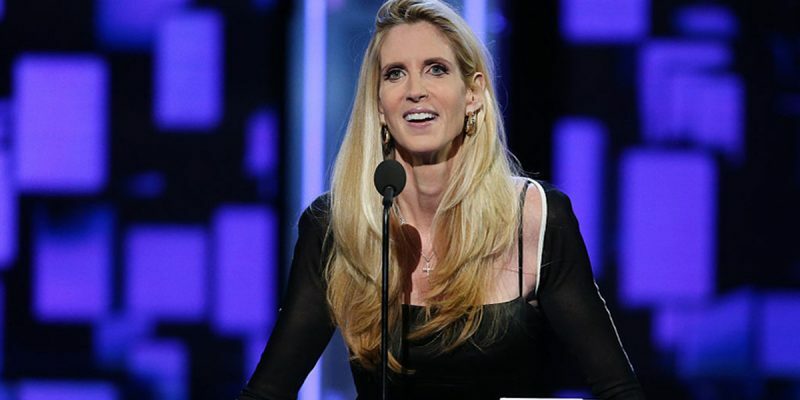 Are You Ready For Ann Coulter's Appearance In Metairie Next Week? Are You Ready For Ann Coulter’s Appearance In Metairie Next Week? This should be a hoot, though Coulter does have something of a hill to climb to beat Laura Ingraham’s speech at the LABI annual meeting in January which caused such a stir that the New Orleans Times-Picayune put out not once but twice the story that a room full of conservative businessmen didn’t like what Ingraham had to say. 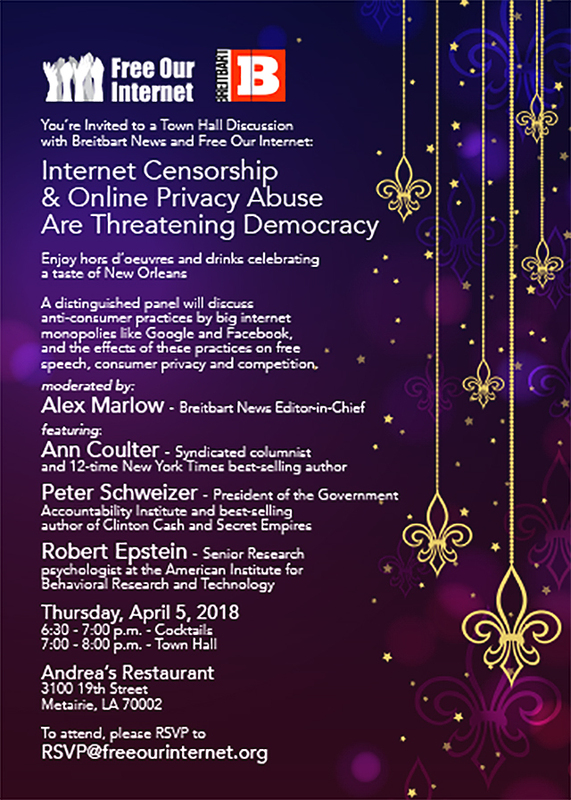 One can only imagine how the Picayune will cover Coulter’s speech, which she’ll be giving at an event put on by Breitbart Media at Andrea’s Restaurant in Metairie Thursday. The subject matter of this get-together is one we’re more than a little concerned with as you might imagine, particularly if you saw our post last night about Facebook’s change in algorithms and the seemingly disproportionate negative effect it has had on conservative media and particularly this site, and our subsequent soft launch of The Mighty Hayride in response. There is a growing concern, given the Facebook issues and the disconcerting James Damore incident at Google, not to mention Google’s decision to de-list several conservative channels from advertising revenue eligibility on YouTube, that the tech oligarchs having an ever-larger impact on our lives are imposing political beliefs on the American people by censoring ideas with which they disagree. Obviously that’s something Breitbart Media would raise a stink over. Free Our Internet is a new organization to us, but here’s the lowdown on them. From May of last year..
Today, Free Our Internet launched its efforts to expose and oppose efforts by Silicon Valley monopolies and the radical tech-left to take control of the internet. The new non-profit citizens’ group will educate Americans about how leftist super-elites and their powerful corporate allies have methodically used their wealth and political influence to erode the public’s internet freedoms and wage war on alternative media. Founded by Donald Trump’s Maine Campaign Director Christie-Lee McNally, the group will empower individuals who support free speech and expression online, protect the diversity of ideas, and oppose government actions that undermine internet openness and transparency. In a well-coordinated and secretive campaign orchestrated by George Soros, other far-left funded activist groups, and Silicon Valley companies like Google and Facebook, President Obama passed rules in 2015 that gave the federal government virtually unlimited powers over the internet for the first time in history. This gave the federal government and its Silicon Valley allies free reign to control our nation’s communications apparatus, together. Less than two years later, these same Silicon Valley gatekeepers, including Twitter and Facebook, have engaged in widespread efforts to censor conservative news, ban conservative voices, and manipulate content across their platforms to benefit their political agenda. “For the tech-left, the internet isn’t about openness and protecting the diversity of ideas. It’s about relentlessly working to control online communication, manipulating America’s political discourse to promote their own agendas and line their own pockets,” McNally continued. “The activist and political left has found common cause with Silicon Valley monopolies – the companies that actually control the platforms citizens depend on for information and to communicate with one another. Under Obama, the internet was taken away from the American people. Free Our Internet and millions of regular Americans will fight to take it back. So it should be an interesting discussion. If you’ve seen Peter Schweizer on Fox News discussing the Clinton Foundation, you know he’s a veritable fountain of information about the corruption in the Democrat Party, and we can imagine Schweizer has the goods on the Left’s corruption of the flow of information on the internet as well. But it’s good advice not to rely on the Times-Picayune’s coverage of the event. We already know you’re going to have to be there if you really want to know what’s said.